I’m still wrestling with the strange feelings resulting from the start of this new trip. Being back in the Airstream that we called home for so long is like going back to Mom & Dad’s house after having moved out. It’s not the same. It seems smaller. It looks worn, as if someone else has been living in it since we stopped. Everything is familiar but different somehow. Perhaps it is true that you can’t go home again. I never did aspire to live in a trailer, I aspired to travel, and the trailer was merely the means. Now that the major travel is behind us, the trailer is more of an artifact or a memento of that trip, like a big scrapbook. Re-entering it is like walking down the corridors of your old high school; still the same but not the place you remember. It was so important back then, but now it is a piece of the past. I tell myself that we lived here for three years but I’m having trouble convincing myself. Did all of those things really happen to us? I suppose that sensation arises because the experience was built from a million individual moments, none of which can be reproduced (and even if they could be, it wouldn’t be the same). It was never about the trailer. It was always about the thrill of discovery. 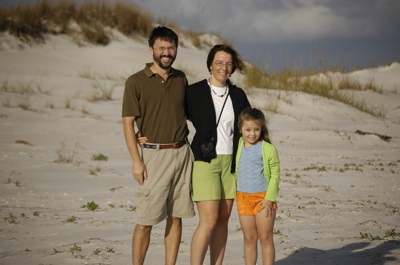 We were always entering unknown territory, both geographically, intellectually, and as a family (watching Emma grow up). We can come back to the trailer, but we can’t come back to the experiences and the way I felt the first time. We can only move forward to something else. Another difference now is that our current trip is more about the friends we want to see along the way, and the business we need to conduct. No longer are we free-wheeling full-time travelers with no fixed address and no deadline to end our travel. This trip has a schedule (a loose one, to be sure, but nonetheless a schedule), and a very specific set of tasks that I need to complete along the way. We know we will be back in Tucson by a certain date. We are not as free to roam as we once were. On the other hand, I can try something I rarely got to do in the full-timing days. Because I’ve always worked in the Airstream, and because the first couple of years of travel were coincident with a very tough developmental period for the magazine, I have generally worked seven days a week as long as we were aboard. I rarely took a vacation for more than a day or two, and never was I far from my computer, my cell phone, and my obligations. Now, since home base is in a house and Airstream travel has become an occasional thing, I can begin to treat the Airstream as other people do. It can be a true “getaway.” We can leave the office behind, pack up the toys, and zip off for a few days to decompress completely. That may seems rather evident to most people, but for us it is a novelty. We are now in Anza-Borrego Desert State Park, in southern California. A few Airstream friends have joined us here, including Terry & Greg from Tucson, Bill & Larry (with whom we camped here a year ago), and David and Ariadna (who followed us from Picacho Peak). Also here are two other Airstreams, one of which I recognize from its Big Red Numbers as a fan of the magazine, so I’ll go introduce myself tomorrow. Monday brought a heap of tasks for me to deal with urgently, so I triaged them Monday night after our six-hour drive, and set aside Tuesday to spend in the office dealing with everything. Eleanor and Emma spent the day out with our friends, leaving me alone to get it all done in quiet and warm desert sunshine. Having gotten most everything under control, I am going to switch to vacation mode for the rest of the week and test my theory about converting my mental picture of the Airstream into a getaway vehicle. Anza-Borrego may be the ideal place to do that. You cannot be uptight in this place. It is too wild and open, too beautiful and too peaceful. There are hundreds of square miles of trails and 4WD roads to explore. Bighorn sheep lurk in the canyons just above us, and shaggy palms are rustling in the occasional breeze. Tomorrow I will take anyone who wants to go out for a tour of the backcountry and spend the day with family, friends, a picnic lunch, and my camera. It will be a starting point for the next phase of our traveling life. Let’s see what happens. Driving away from the house this morning we had a sense of leaving something behind, which we have rarely felt during our full-time years. It was awkward, feeling as though the house was the center of our universe, and getting in the Airstream to travel was somehow a deficit. We have always felt centered by being together, regardless of where we were, but suddenly it was different today. It felt like leaving home. It felt strange. The sun sets early this time of year, and even in the desert southwest the nights are long and cold. The interior of the trailer shrinks at night (and the exterior gets longer, if you are still towing after dark). We bumped into each other as we did back in 2005 when we were new to full-timing, and gradually re-adjusted to the practicalities of life inside 200 square feet. Making this adjustment in the middle of the winter is a bit more difficult, which is one reason why I recommend that people who are going to travel full-time start in spring or summer. But in all other respects, it has been a typical day on the road. We traveled a mere 70 miles, to this interesting state park near I-10 between Tucson and Phoenix, to meet our friends David, Ari, and William. Those of you who have followed our travels for a while may recognize them as the family we traveled with to Mexico last April, and who we visited about a year ago at their home in Ventura, CA. In early 2007 we climbed the steeper of the two routes and reached the Saddle, in somewhat intense heat. The climb is, frankly, brutal and unrewarding in itself, but the view is good. Going beyond the Saddle to the peak requires more time than we had, and gloves are useful for steep rocky sections and grasping steel cables. Tomorrow morning we are going to hike at least part of the second trail with David, Ari, and William. It is longer, at about 3.1 miles one-way, but shallower. We are not likely to complete the trail, because not everyone in our group is ready for a hike of this nature, but we’ll at least get a good taste of it and we can use that to plan a future summit. The cold continues today. Around Tucson it warmed into the mid-50s, but here at Picacho it felt cooler, with a breeze. Still the campground has at least two dozen trailers parked in it (although not many signs of life from most of them). In the dark the temperature has plummeted again, and we expect to be near-freezing again tonight. Since we chose a non-electric site in the campground, I’ve got the catalytic heater going and it looks like it will have to run all night. It will be a chilly morning to go on a hike tomorrow, but we’ve got the clothing and gear for it. Short of driving to Mazatlan or south Florida, we can’t escape the cold this time of year, so we will just have to embrace it. It is cold this morning as we prepare the Airstream for departure. Very cold, for Tucson. Last night was one of the occasional freezes this town gets in the winter, and this morning everything outside is covered with frost. I hate preparing for a trip in the cold, because every job is harder and slower. My fingers, required to be bare for some jobs that require nimbleness, are aching at the touch of cold metal on the hitch, cold tools, and frosty propane tank cover. The air in the tires has shrunk from the cold, each one measuring only 48-52 psi when they should be at least 60 psi. The interior reminds me of the movie 2010 when the crew re-enters the frozen Discovery space ship: initially dark, quiet, and with a slight odor of dust signaling abandonment. HAL 9000, are you there? This morning’s task is to re-activate the ship. I left the furnace set at 50 degrees last night so the trailer wouldn’t freeze, and this morning switched over to the catalytic heater. Over a couple of hours, it will efficiently saturate the interior with heat, making Eleanor’s re-packing work inside more comfortable. Meanwhile, I’ve been outside pumping up the tires, checking the propane level, and verifying critical items in the storage compartments. For the most part the trailer is ready to go, and it seems the majority of the departure checklist has to do with things inside the house. Among many other tasks, today is “Pick the Grapefruit Day.” The freezing night should have finalized the grapefruit (it is said that it makes the fruit a little sweeter), and in any case the tree is heavy with 90-odd softball-sized yellow fruit. We can’t possibly eat them all, and I doubt they will last until we get back, so my plan is to juice most of them today and have fresh grapefruit juice every day for the next couple of weeks. I already squeezed a bag of ten or so and made a liter of juice. Now the problem is to find enough empty containers for all the juice I’m making. 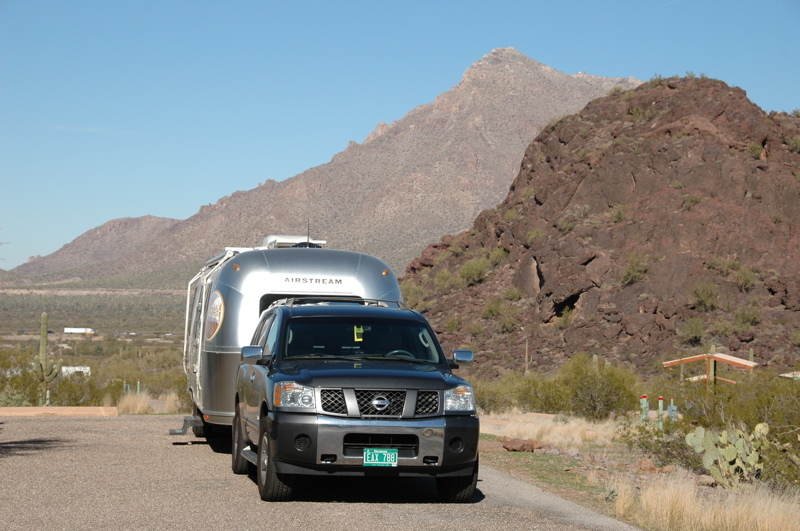 I had spoken in an earlier blog about my goal to keep the Airstream ready to go in less than an hour. It turns out that we have achieved that goal — for a weekend. To just zip out the door and take a few days, no problem. But to go for a month or more, we have to make considerable preparation. It was so much easier when we had only one home (the Airstream), but now with two homes we have to think carefully about where things are. But all of that is relatively minor. So far the trip prep has contained only one major surprise: the car battery. The cold snap this morning revealed that the Armada’s battery is a goner. I jumped it from another car and now we’ve got a new battery. Better now than while we are in Anza-Borrego. Both of the rechargeable batteries for the cordless drill are dead too, but those are easily recharged. The cold and the lack of use are starting to show. For the next few weeks, while we are on the road, I will be posting more regularly. Like many other people, in the past few weeks we’ve been receiving Christmas cards and letters. But we haven’t sent any. It’s not that we are opposed to Christmas spirit, like The Grinch or Scrooge, it’s just that we are terribly conflicted and perhaps somewhat incompetent. (That’s not better, is it?) Currently I write this blog, and prior to this I wrote another blog for three years, and prior to that I had even more blogs about various projects. Considerable aspects of our lives have been well documented on the Internet, and there’s hardly more anyone would care to know about us. So why be redundant and send out a form letter to everyone? A Christmas card would be nice, but really, it seems to be beyond my ability. I can write a blog every day for three years. I can write, edit, and produce a magazine four times a year and ship out 12,000 copies. I can maintain multiple websites, manage a staff of 10-15, and write personal responses to over 8,000 emails* every year. But I can’t manage to buy two dozen Christmas cards, address them, and get them in the mail. There is clearly some sort of mental block here. * Note that this works out to an average of 21 email responses every day, 7 days a week, 365 days a year. That’s with me responding to only about half of the personal emails I get, too. If you got a note from me in the past year asking you to please remove me from your email joke list, that’s why. Sending such requests may lead to people thinking perhaps I really am Scrooge, but it’s just me trying not to disappear in a quicksand of electronic messages. You’d think that out of the 10,000 or so photos I shoot every year I’d at least get one or two photos of the three of us. Not so. A couple of years ago I tried to make up for the lack of photos of us together, by handing my camera to bystanders when we were at scenic spots. I ended up with a lot of photos of us appearing as badly-lit dots in front of things like Crater Lake and the Grand Canyon. After several disappointments, I set up my tripod on the beach at St George Island (Florida) and tried to do it myself with the camera’s self-timer. The result was a lovely photo of Eleanor and Emma, with me grimacing in the bright sun. The wind was so strong that day that on the 14th or 15th take, the tripod blew over and the Nikon got buried in the sand. The pop-up flash stopped working, and despite repairs, the camera has never been the same since. We didn’t use the pictures, either. I’m not alone in my Christmas-card-impeded state. For many years, Eleanor has written long long Christmas letters with complicated tales of our year in review. The letters usually get printed out on fancy colorful paper, stacked in huge heaps, and then neglected until roughly February. At that point, under prodding by me, a few get mailed to elderly relatives who don’t have Internet, and the rest go into recycling. This year, Eleanor tried a new tactic. She wrote a rather succinct letter about our 2008. Those of you who followed the Tour of America would find it very amusing. It basically says, “We continued traveling in our Airstream,” and “Emma is doing well with homeschooling.” Succinct, yes … and for details, she provides the URL of our travel blog. I’m sure some of the relatives who get it will interpret this as: “We still live in a trailer because we can’t afford better,” and “we’re neglecting our child’s education.” But we realize that the letter would mostly be going to relatives and out-of-touch friends who have little interest in the details. Reading a Christmas letter from someone you haven’t heard from in a while is an amusing bonus, something to lighten up the dark winter days. You get a chance to find out how weird people have gotten since you last saw them. We don’t want to disappoint anyone. I’m always amazed when someone does manage to get cards or letters out, and I appreciate each one very much. If we ever got a round of cards out I suspect we might shock some people to the point of requiring medical attention. I can’t say yet that we will do so this year. Eleanor’s current letter exists only as a draft, with a total of one copy printed, and it’s December 22. I have a feeling that, given we are two days from Christmas and leaving for an extended trip in five days, the letter may languish until February again. It may end up as an email. Perhaps the best move would be to write next year’s Christmas letter early. If we started in February 2009 we might actually get it out by Thanksgiving. All we would need to do is predict what we might do in 2009, which would be far more amusing anyway. When the letter actually hit the mail, we could compare the prediction to the reality for our own benefit, but for the purposes of people receiving it, it would probably be close enough. But that might be too boring. As Emeril might say, why not kick it up a notch? It’s always healthy to set goals for yourself. If any of those things happen, you’ll read about it here. I think you’ve figured out by now that you shouldn’t wait for the Christmas card. In the run-up to Christmas, a lot of tasks and projects have been shunted aside, but one item that remains prominently on our list is our next Airstream trip. We have been looking forward to a few weeks of travel ever since we arrived in Tucson (an event which marked the end of our full-time travels). The plan has always been to head to California and then roam around. Primarily, that’s because in the bottom of the winter the weather conditions limit our travel. From past experience we know that southern California, all of coastal California, and low deserts are generally reliable place to go, but even those places can have very chilly nights. It’s also important to keep elevation in mind at all times, since — as I’ve said many times — weather out west is determined by altitude, not latitude. That means we won’t be heading to Flagstaff (7000 ft), or for that matter, anywhere in northern Arizona, northern New Mexico, the Sierra Nevadas and other mountain ranges. This time of year we even have to be careful about highway passes that exceed 4000 feet, since they can be snowed in while other parts of the road are sunny and warm. Because of the need to stay low, our favorite spots in the west during winter are Organ Pipe Cactus National Monument, Anza-Borrego Desert State Park, San Diego, coastal Rt 1, the Sacramento Valley, and Death Valley. Oregon is decent along the coast too, but we won’t be going that far north this time. The trip “plan,” such as it is, loosely calls for visiting most of those spots over a 3-4 week period. As always, we are winging it on most of the details, but we do have a few definite stops that will be the framework for the trip. The only reservation we’ve made is for Anza-Borrego, because winter is peak season. That particular stay was booked last July. The Airstream is sitting ready to go, with only a few things left to be packed and checked before departure. Since our arrival I’ve had a lot of time to take care of wear and tear from our last long trip, and there was quite a list. The Armada needed a pair of exhaust manifolds (they seem to crack every 30k miles, the only significant maintenance problem we’ve encountered with this vehicle, but fortunately I got an extended warranty which covered them). The Armada also needed a new set of tires, oil change, some minor body work, and a thorough cleaning. Our friend “Tucson Terry” commented that we are now like everyone else, planning and looking forward to our next trip. It’s true. It’s not a bad thing, either. There’s a certain excitement in anticipating a great tour. Planning it and dreaming about it really is half the fun. I felt the same sensation even when full-timing, because there were always low points where we were mostly parked and waiting for the next major stop. One very pleasant change since the last time we traveled is of course the startling drop in fuel cost. In our final month of full-timing, fuel was so expensive that we heavily curtailed our driving distances. In Utah, we paid as much as $4.54 per gallon, and at one point we were elated to find a gas station on an Indian reservation that was “only” $3.80 per gallon. Even though we needed less than 1/3 of a tank, we filled up to take advantage of the low price. Those were the days of $80-100 fillups. Yesterday I filled up the Armada for $26.88. It seemed almost like cheating. But since this multi-week tour will cover 7-9 stops and at least 2,000 miles, I’ll take the discount. We’ll save about $500 compared to fuel prices just three months ago. Since we can afford to go a little further, and make more stops, this trip will be heavily oriented to seeing friends we made while we were on the road. Every stop we have in mind will involve someone who befriended us along the way, and with whom we share some special memories. I suppose this could be viewed as a trip of reminisces, but really it’s about continuing to make new memories. I doubt we’ll spend a lot of time looking backward, and for sure we will try to explore some new territory as we go. For benefit of our friends in the Revenue Service, let me point out that we also have numerous business-related stops along the way. While we are traveling, I may resume daily or near-daily blogging. This is as much for my benefit as for anyone who is interested, because if I don’t keep a journal I’ll forget what we did. Those of you who have been deprived of photos in this blog can rejoice because no doubt my camera will get heavy use. (I only hope it keeps working — it’s showing signs of age lately. It would be nice if Santa brought me a new Nikon D90, but I forgot to put it on my wish list.) The trip begins December 28.